This was the day we finally should arrive at Donjek Glacier. And the route seemed pretty good this time. 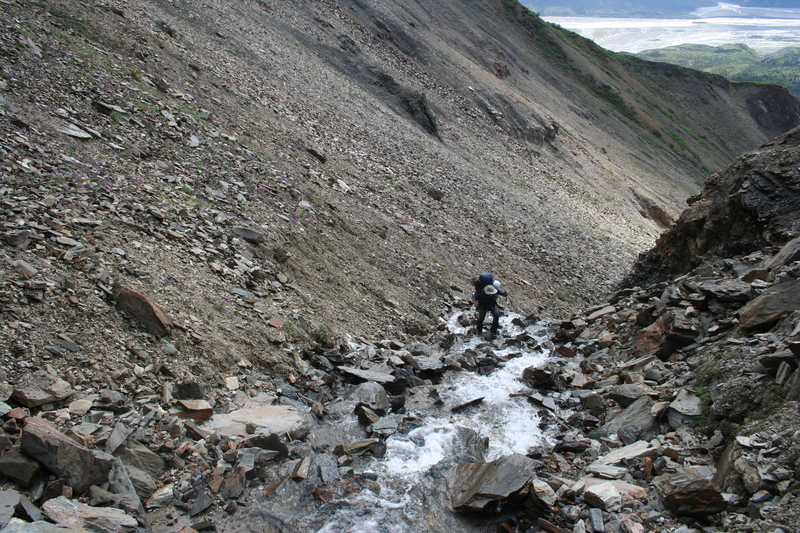 Some more bushwhacking to the riverside, scrambling over some rocks and arrive at the Glacier was no problem. We could hear the occasional cracking of the glacier. It sounds like an old ancient natural being. Just astonishing. After finally deciding to go on we came through tundra with a couple of hills and meadows and all kinds of flowers. Peaceful and sound. Hm…. We had to decide were to go up to leave the valley. One ranger recommended us an alternative route over expectation pass, instead of the river delta. And it seemed like a good idea since we had fresh water along the road. The pass was very steep with around 500m change in height. But after taking a short bath at the bottom of the mountain I felt rejuvenated, that we were actually quite fast climbing along the stream to the top. An impressive view at the top and cooking place rewarded us in the end.